Every day Angela asks me, "How many days until my surgery?" We're both anxious, but I think for very different reasons. I have explained to Angela several times that she will still have her gtube when this surgery is done. Unfortunately it doesn't matter that we have the conversation every day, even multiple times per day, she is convinced this will be the end of the tube. She wants her life back, and in her mind her gtube represents when her life changed so drastically. But Dean and I, we are anxious as parents tend to get. This surgery is completely expiramental. It has never been tried before. There is no way to predict how her liver, or her body, will respond to the changes about to be made. She has a history of wound healing problems, and there is no way to know if this will still be a problem, altbough the doctors suspect it was due to undiagnosed hyperammonemia. And then there are the wounds themselves. They will be huge. Oh my baby girl. I hate this for her. And then there are the logistics of the hospital stay. Angela will be in intensive care for several days (a week to 10 days was the guess) then another week or so before coming home. There will be lost income and much juggling of the other kids, but I think we're as prepared as we can be. 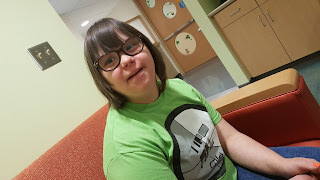 Today we went to the hospital for ultrasound imaging of Angela's legs. Her doctors wanted a good look at her vasculature as they plan to use one of the veins to close the defect in her liver. We were both glad to be one step closer. Two days before surgery we will go back for bloodwork to get her typed and crossed as they anticipate she will need blood during surgery. She was all smiles waiting for her ultrasound. That sounds absolutely terrifying. Hope everything ends well for you guys. Good luck to Angela!